Peter C. Phan, noted for his theological exploration of the afterlife, presents an easily understood study of what eternal life means from a Catholic/Christian view. 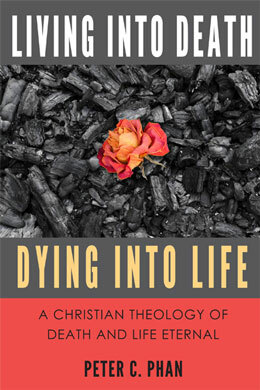 In Living Into Death, Dying Into Life: A Christian Theology of Death and Life Eternal Professor Phan elaborates and expands material first presented in twelve lectures. Drawing heavily from the Christian Tradition, Phan identifies sections in the Old Testament and especially the New Testament that are relevant to eschatology, which is the search for an understanding of God’s final kingdom. Seen in the preaching of Jesus as presented in the Gospels, the Kingdom of God is both here now and also fulfilled at the end of time. Professor Phan is able to connect Scriptural representations of the afterlife with the ramifications of eternal life in our present everyday life. This book is intended for audiences seeking to understand the death of a loved one, an impending death, or death in general; as well as those who are seeking a general spiritual or theological understanding of eternal life as presented by Jesus Christ. As your introduction to Living Into Death, Dying Into Life, an excerpt is available for you to sample on your iPad/iBook or any other ePub reader. Reality and Imagination: How Do We Know and Talk about the Afterlife? Death and Dying: End or Beginning? The Afterlife: Immortality of the Soul or Eternal Life? The Reign of God as the Goal of History: What Did Jesus Live and Die For? From Death to Resurrection: What Happens in the Meantime? Eternal Hell: A Contradiction to God’s Love? Resurrection of the Dead: Resuscitation or Transformed Life? Jesus’ Return in Glory: When and How? The Eucharist: A Foretaste of Eternal Life? The End of the World: A New Heaven and a New Earth? Epilogue: Envoi - An Unfinished Ending?